The Moravek mixer model C has been developed for the automatic production of a range of carbonated beverages from water to syrup. It is suitable for all types of carbonated beverages and soft drinks as well as both natural and flavoured mineral water. It is also suitable for carbonated beverages with a fruit content not exceeding 20%. CO2 content range is from 2.5 to 9 g per litre. The CE/J model has all the functionality of the model C but additionally is designed to produce still and low carbonated beverages under an inert gas atmosphere. It can also be used for the production of iced-tea and energy drinks. The CO2 content range is from 0 to 9 g per litre. The machines have been developed with ease of use and speed of production in mind. They have fully automatic cleaning procedures and beverage production can be changed simply and easily with 30 different recipes saved at any one time. Recipes have independent parameters set for each product and can be either adjustable or password protected. The machine is fully automatic and does not require operator input unless there is a fault or a change of production type. Mixing is batch based and does not require the dosing of the pump. Products are easily changed and up to 20 different recipes can be stored at any one time. Procedures are fully automatic including the deaeration of vessels before production starts. Mixing is electronically adjusted making the process highly accurate. Carbonating is electronically controlled and therefore consistent across the batch being produced. Beverages can be produced chilled, at an ambient temperature or up to 20 °C. 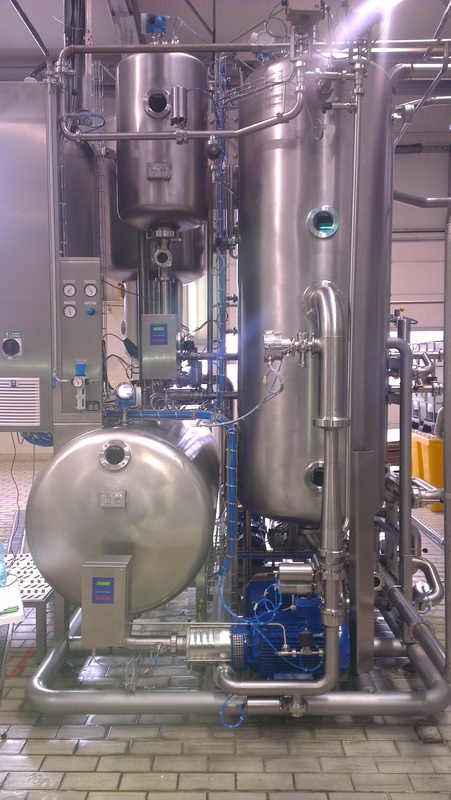 The product is transported to the filler with an automatic delivery pressure control enabled by the booster pump. There are two types of automatic CIP procedures available; rinsing before product change or a full CIP procedure including gas regulators inside the pipework system. Both models have a low level of consumption of cleaning solution. Models incorporate an Allen-Bradley control system and colour TFT display for comfort operating. Machines are fully constructed in stainless steel. They are easy to maintain and the possibility of mechanical failure is lessened by using a minimum number of moving parts. LPH, 18000 LPH, 24000 LPH, and 36000 LPH. 1:5 to 1:50) but can be adjusted depending on individual customer requirements. The mixer is produced ready to communicate (via digital signals) with the water and syrup booster pump, the CIP unit and with the filler. 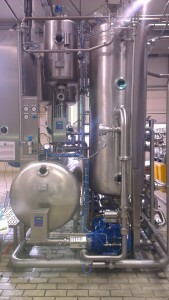 The CE model is additionally able to communicate with the pasteurizer. It is also possible to increase the number of digital signals available if necessary.